The Monkey King is perhaps the only animal that appears on the Beijing Opera stage as a lead character. The origins of the monkey king are obscure but the figure gained widespread recognition in the character of Sun Wukong in the epic Chinese novel, Journey to the West (1590s). The monkey king possesses supernatural powers and a great sense of humor. 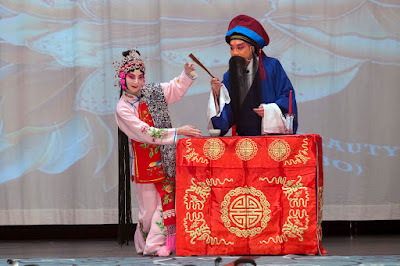 While the Beijing Opera version of the monkey king is not what any Westerner would think of as opera, it is a highly stylized form, lacking scenery and with combat scenes that are closer to dance than to stunt work. The level of acrobatic skill, is incredibly high and the action is full of physical comedy. 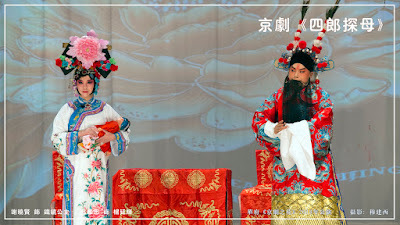 In this act, the plot itself is simple: the Monkey King disturbs a banquet in the celestial palace because he was annoyed being looked down upon by the supreme emperor. After the fight with Hades, I became an immortal and will live forever. My name is Sun Wukong the Monkey King. After several battles here and there, I have won the title of Divine Parallel to The Sky. I have some spare time today. Why don’t I visit the Immortal Peach Banquet! Look over there, what a sparkling wagon with gold yellow shade. He wears a purple gold robe embroidered with dragon figures. Shaking my body mimicking someone who put on a lot of airs. Mimicking someone who put on a lot of airs. Let me use my supernatural power and check what is served at the immortal peach banquet. (Speak) I am here at the Yaochi Fairy Land. Nobody is around yet. Let me break into the palace. So much great food. Too bad I have a small stomach and could not take them all. Got it. Let me take a body hair and turn it into a bag. I will take these food with the bag for the youngsters in the monkey family back on earth. Oops! I must have caused big trouble this time. No one is around. Let me run away! I am here to catch the Monkey for conviction. The Monkey King is perhaps the only animal that appears on the Beijing Opera stage as a lead character. He possesses supernatural powers and a great sense of humor. It’s a trickster character originated from Chinese folklore and classic literature, a combination of Robin Hood, Superman, Zorro and Charlie Chaplin in the western culture. 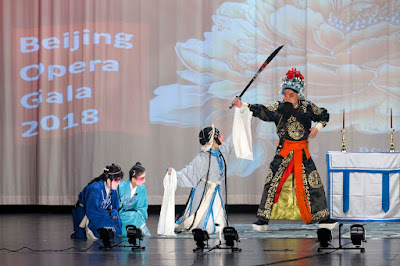 While the Beijing Opera version of the Monkey King is not what any Westerner would think of as opera, it is a highly stylized form, lacking scenery and with combat scenes that are closer to dance than to stunt work. The level of acrobatic skill is incredibly high and the action is full of physical comedy. In this act, the plot itself is simple: the Monkey King disturbs a banquet in the celestial palace because he was annoyed being looked down upon by the supreme emperor. Full moon is an auspicious and family reunion symbol in the Chinese Culture. The Drunken Beauty is on her joyful way to see her husband the Emperor. She is so proud of being a born beauty, even brighter than the full moon. When seeing her, all flowers are too shy to bloom, fishes are too shy to swim, and wild geese would fall down from the sky. 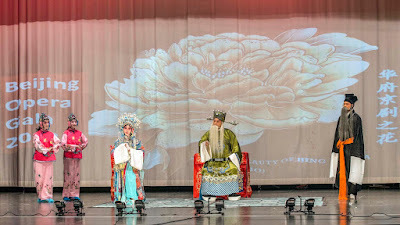 This is what was elaborated by DCBBO yesterday in the Beijing Opera Classics, the Drunken Beauty, at George Washington University in observance of the Chinese Mid-Autumn Moon Festival 2018.